Eating pineapple is good not only because it contains bromelain but because, well, it tastes good. Bromelain is just an added benefit of eating pineapple. Pineapple contains the enzyme bromelain. Many physicians regard it as a substance that helps our bodies fight inflammation among other known great effects. Many fruits have benefits that you never knew about and pineapple is no exception. A whole pineapple contains over 7 times the minimum daily recommended amount of vitamin C.
The fiber contained in pineapple will help your body to function properly. It is rich in antioxidants and will fight free radicals. It supports heart health due to the fiber, potassium and vitamin C it contains. It contains tryptophan that your body changes to serotonin. This substance will help you have a healthy night’s sleep as well as affect your mood in a positive manner. The bromelain may be effective in the fight against cancer. It is a natural and safe substance that will not harm your healthy cells. 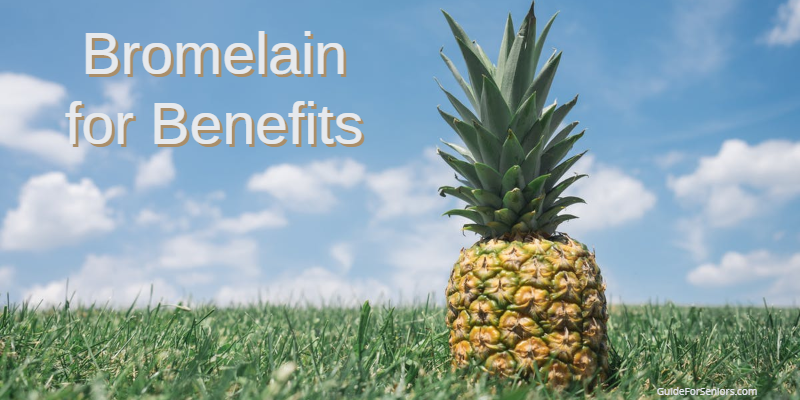 Bromelain fights inflammation in your body. The enzymes in pineapple aid in your digestion process. The enzyme bromelain contained in pineapple supplies many of its benefits. Other fruits, as well as nuts, contain this enzyme. However, the core of a pineapple has an overwhelming supply of it. The supplement contains more bromelain that we can get by eating one pineapple or even by eating ten pineapples. Physicians often prescribe it after surgery or after an injury. This enzyme helps your body produce the substances that fight inflammation. In addition, it contains chemicals that interfere with the growth of tumor cells. Thus the suggestion that it will help to fight cancer. However, this supposition has not been proven. Nevertheless, it will not be harmful if you take it. Bromelain is also associated with slow blood clotting. It is advisable to talk to a physician if you are having any surgery or procedures. To reduce the risk of bleeding, you are often requested to stop taking the supplement two weeks prior to any surgery. Many patients begin using it a few days after surgery to help reduce swelling and for pain relief. If you are on blood thinners or have bleeding disorders also talk to your doctor before continuing with bromelain. The fact that it is associated with slow blood clotting may interfere with your medications. If you are allergic to pineapple, definitely stay away from bromelain. This also affects those with cross-allergies to pineapple. The items associated with pineapple allergies are latex, wheat, celery, papain, carrot, fennel, cypress pollen, or grass pollen. It only means that you might have an allergic reaction to bromelain, and probably only if you take the substance in very high doses. More is not necessarily better. We keep bromelain as part of our anti-aging arsenal for its potency in reducing inflammation and swelling. By reducing these symptoms, we are helping our bodies to help us. We want to be as healthy for as long as possible. Bromelain helps us with this goal. Pineapple is great for your skin. It often will help to heal and soften the skin. Rather than smothering your skin with pineapple, the recommendation is to take bromelain. The enzymes you are consuming aids your body in its fight against inflammation. As an added bonus it will help to reduce the wrinkles aging produces. Topical cremes containing bromelain have been shown to help burn patients with wound healing. It also reduces the red appearance of the skin. As the substance rids your skin of broken down collagen, it also rebuilds the same substance. This causes your skin to have a more youthful appearance, thus even more anti-aging properties. Thus its use in our anti-aging regime as a supplement and as a facial creme. Measuring units are important, but for our purposes, we use the number of grams of bromelain in each supplement capsule. To aid our body in fighting age-related symptoms, the dose should be between 200 to 800 mg. However, if your physician prescribes the enzyme to help with digestion issues, he may recommend a dosage of between 200 to 2000 mg taken at meals. We recommend purchasing bromelain from our preferred supplier IHerb. Click here to go the Bromelain 500mg by Life Extension. Read more on Guide For Seniors for information about supplements and how they affect our anti-aging.